Quit yanking cables out of your guitars. When it's time to switch instruments during your set, just rely on your BigShot i/o. This straightforward, value-packed box lets you plug your two main guitars right in, using one out to feed your amp. Switching between guitars is totally painless. And the BigShot i/o even has a mute switch that routes your audio to the tuner output, so you can sort out your tunings midshow (there's a switch for "always on" tuning too). 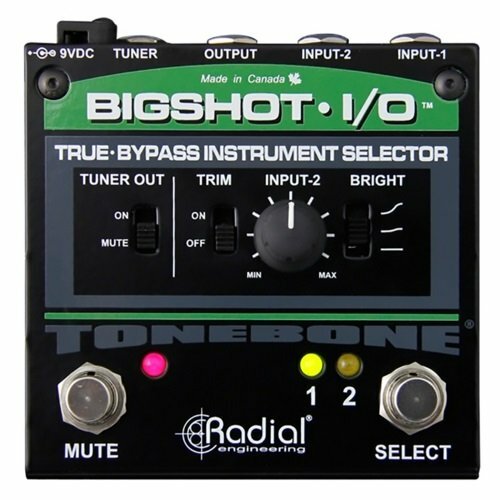 What makes the Radial BigShot i/o a total home run, though, is the level control on in B. Even if you've got two axes with drastically different out levels, you can use the level control to adjust the out so that you've got the same guitar level every time you switch. Simple enough!